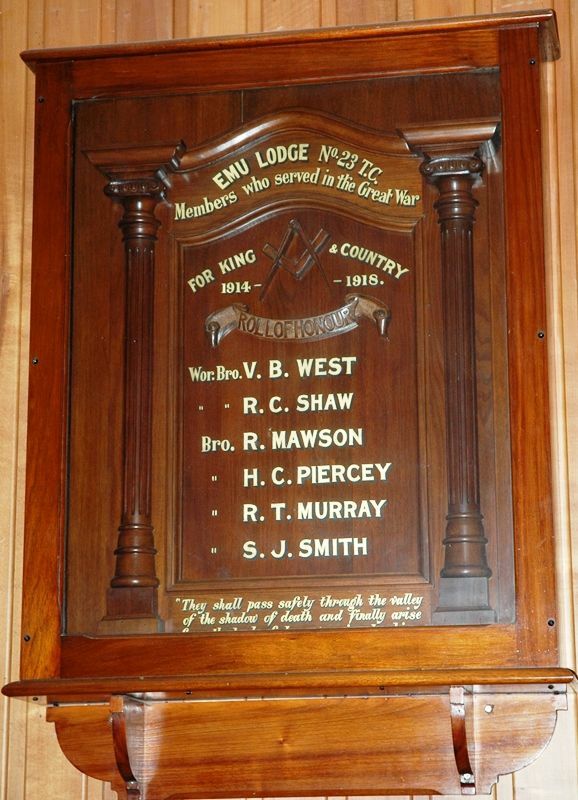 An honour roll commemorates members of the Emu Lodge No 23 TC who served in World War One. At the monthly meeting of the Masonic Lodge held last night, the honour roll of members of the Emu Lodge was unveiled by Chaplain W. G. Thomas. The roll, which is a beautiful piece of carving in Tasmanian blackwood, bears the following names:- R. Mawson, R. Murray, H. C. Piercey, R. C. Shaw, S. J. Smith, and V. West, all of whom have returned to Australia and entered civil life. Examiner ( Launceston), 17th May 1921. They shall pass safely through the valley of the shadow of death and finally arise from the tomb of transgression to shine.